We are creating a factory that will clean and link all UK public data. The diagram below outlines that data, and the sections are explained beneath it. Raw data is brought in through the upload process, where the user who is uploading it attaches metadata about who published it and how it came to us. Data will come to us in many formats (CSV, JSON, XML, RDF, Microsoft Excel), and the raw API will translate it all into one format so it can be used with the rest of our data. 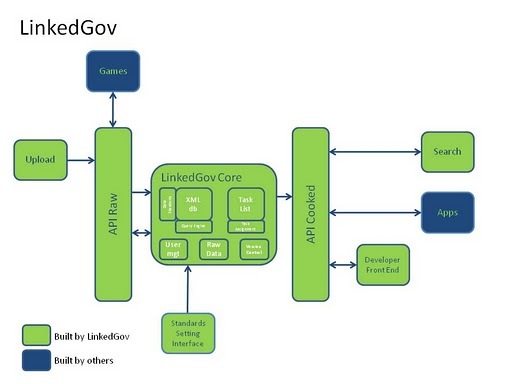 The LinkedGov core holds the warehouse of our factory (keeping our data in the data store), along with the assembly line of tasks we need to perform on it (in the task list). It also manages the overhead functions of user management and version control on the data. Games and activities, at the top, will take the tasks from the assembly line and distribute them among game players, who will help us perform the tasks. This will help us get through the long list of problems we’ve marked in the data that must be addressed by a person (in other words, our technology can’t fix it alone). The standards setting interface allows developers to create new standards on a particular topic (for example, electricity usage data or the length of fish found in a specific river). Our data is then available from the cooked API for any app or project that needs it. The developer front end allows people to navigate the data, discover what interests them and register for API keys. The question site (marked here as “Search”) will allow users to ask questions of the data. This site is particularly aimed at non-technical contributors to LinkedGov, offering them both a reward and incentive for getting involved with helping us upload, clean and link the data. As a local authority publishing open data, what do we have to do to get involved in the project? Is it just a case of uploading our data? We dont really have the resource to do that, so is there a way to automate that process?